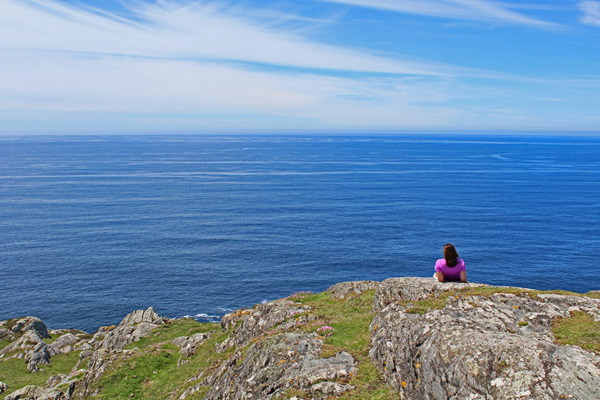 We left Mizen Head to travel north on the next leg of our journey around Ireland’s Wild Atlantic Way (if you want to see all about our last leg, you can catch up here). 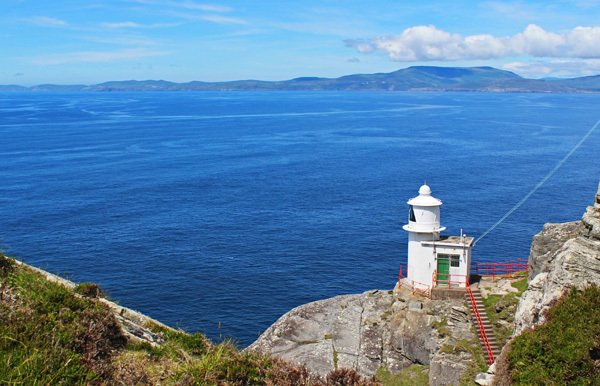 This leg takes us from the village of Durrus, out along the south of the Sheep’s Head Peninsula to the lighthouse at it’s tip – then returning along the north part finishing up in the town of Bantry. 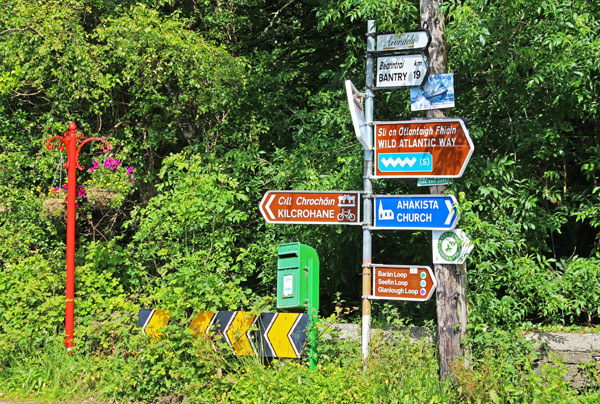 A crossroads with all manner of communications! I can’t believe the weather we were having for a June weekend – hardly a cloud in the sky, only a light breeze and warming up nicely! It was early on a Saturday morning – the roads were quite empty and we stopped at the little village of Ahakista just to take in the views and enjoy the weather. One of the things I love most about the Sheep’s Head Peninsula (well, more than one actually) – is just how undiscoved it is. 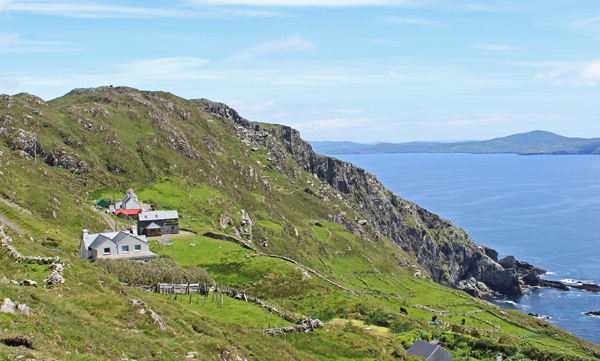 The other peninsulas on the southwest seem to attract all the traffic – from Mizen to the Ring of Kerry and up to Dingle. The other thing I like is the Sheeps Head Way. 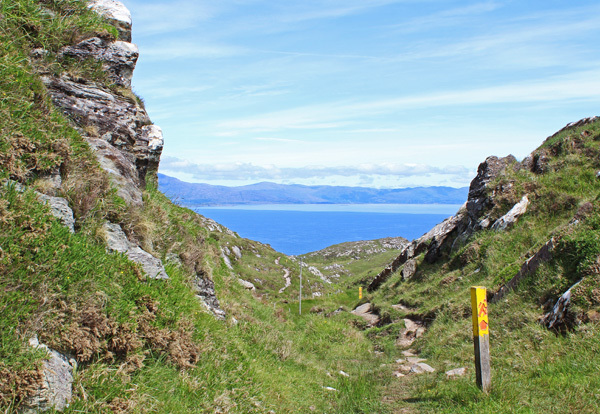 This is one of Ireland’s long distance walking routes and it brings you through the most amazing scenery while also bringing you back in time with plenty of historical sights along the way. But don’t be put off by the term “long-distance” – there are plenty of shorter walking routes along its way that you can drop in and drop out of. One of these shorter loops takes you up beside the remains of an ancient “Bardic School” – run by the O’Dalys back in medieval times for the local O’Mahony chieftains. The qualified Bards were expected to learn the great works of Irish history and legend. Training in this school typically took seven years to complete and then the Bard travelled the land entertaining the various royal households – or entering into a retainer relationship for just the one. It is said that a King of Spain sent both of his sons to be educated at this school, but they drowned in the lake where they promptly turned into swans (you can only imagine the embellishment that happened so close to a Bardic school!). 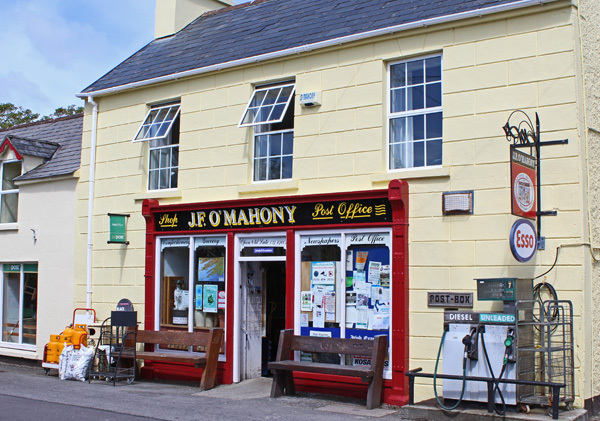 The O’Mahonys were chiefs of this area for hundreds of years – but were pushed back into the Mizen Peninsula by the McCarthys and Norman families. The O’Dalys were a major Poet (Filidh) family throughout Ireland but the Sheeps head Peninsula was one of their areas of settlement and you will still find the name Daly/O’Daly in great quantity throughout this area. 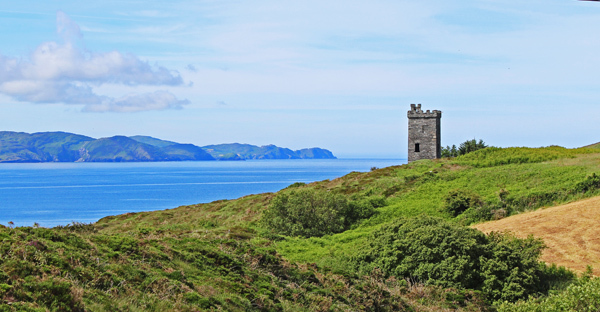 You will find signal towers like the one in the picture all around the coast of Ireland. They were built in response to the unsuccessful French invasion in 1796 (see the section on Bantry below). The plan was to signal vital information using a system of flags. However, most of them were abandoned following the end of the Napoleonic Wars. The village of Kilcrohane lies about three-quarters of the way out the peninsula. It’s a quiet, friendly village – stop and ask the way here and you might be staying a while longer than you bargained. We had a look at the old homestead of the family of one of our readers – took a few pictures and sent it onto them. Lovely to be involved in closing such a loop for them. Brien, Coakley, Coghlan, Daly, Donovan, Hickey, Lehane, Mahony, McCarthy, Spillane, Sullivan and Tobin. When you wind all the way to the end of the road, you will end up in countryside where the sea is just a couple of miles either side of you. 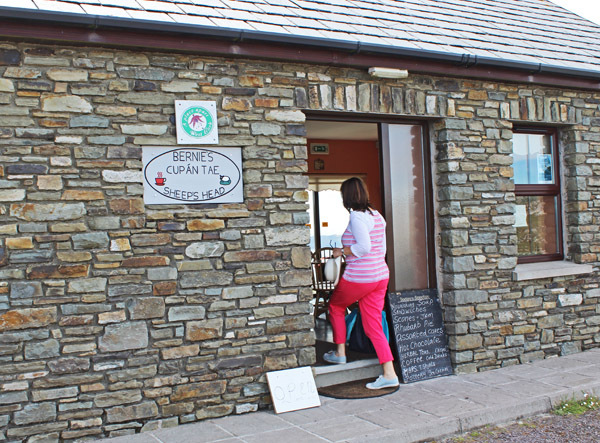 We drove along the narrow finger of land at the end of the peninsula and came to a stop just outside Bernies – and just in time for her famous salmon sandwiches and rhubarb tart. All taken with a cup of tea on one of the park benches outside and looking out on a view that had not changed for thousands of years. If you do make it this far – and you are up for it – it’s well worthwhile taking the final trek on foot (about a mile) to the end of the peninsula and the lighthouse. You are really out in the middle of the Atlantic, with the most sublime views (in most weathers!) all around. I reckon we could have stayed there – just gazing west into the wide ocean for hours! 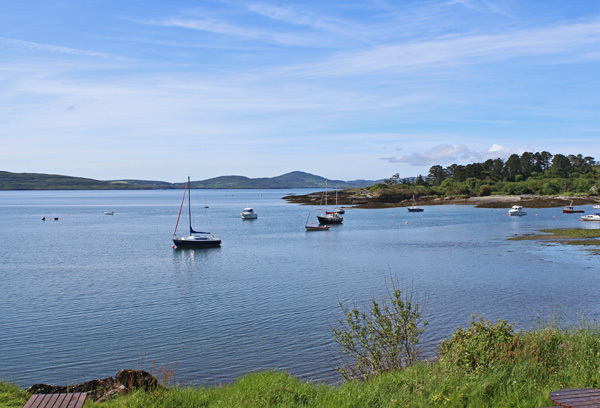 After a very pleasant trek back to the car – we started to journey along the north side of the peninsula back to the seaside town of Bantry. 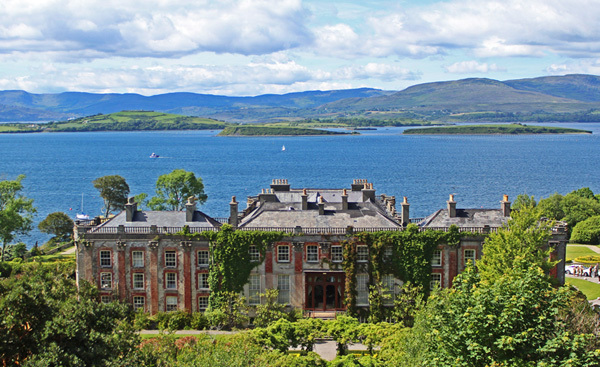 Our first port of call was the beautiful Bantry House – in one of the most beautiful settings! 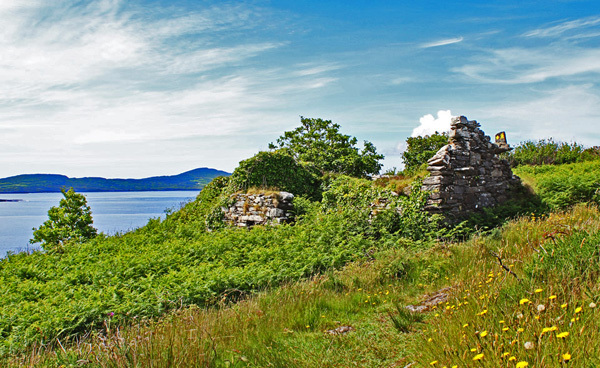 It’s situated just outside the town itself and looks over Bantry Bay towards Whiddy island and the Beara Peninsula. A Wedding photoshoot was in session on the front lawn when we arrived – what a day to capture such memories! Bantry House and Gardens are open to the public – but are also still lived in by the Shelswell-White family. The house also hosts a wonderful chamber music festival each June. I think one of the best pictures in Ireland is the one above (not necessarily my version!) – and you will see it spread across many guides to Ireland. Bantry town itself sits on the inside of Bantry Bay which in turn has a reputation as one of the safest harbours in Europe for many centuries, being very deep and sheltered by the mountains. Over the years, the fishing fleets of other countries fished the bay, paying tax to the O’Sullivan Beara family who controlled the area. In 1796, forty-three ships set sail from France to support the cause of the United Irishmen – in this case to liaise with Wolfe Tone. However, storms off the Irish coast dispersed the fleet and they abandoned the attempted invasion and sailed home to France. Wolfe Tone was executed shortly afterward. The growth of the town after the 1600s is due to many English planter families and traders settling in the area – drawn by the quality of the fishing – in fact you can see many of these names still over the provision yards in the area. One of these families was the White family mentioned earlier in connection with Bantry house. Because of the assistance he gave to the British military during the 1796, Richard White was made Earl of Bantry in 1816. But there are a LOT of Sullivans/O’Sullivans! Thats it for this leg of our journey around the Wild Atlantic Way when we head around the Beara Peninsula and on to Kenmare town. QUESTION: Have you been to this part of Ireland? Do any of the Irish names in your family tree come from here? Do You Know this Irish American Hero? Hi Mike now you are getting close to where my.ancestors are from, Caheragh between Bantry Bay and Skibbereen. It’s heart warming to see the pictures from Bantry Bay and..Bantry town. I’ll print them to drool over and save until I am able to get.there. Thank you so much. That’s great to hear Diane – let me know if you want any special photos before we head out to Beara in a week or two – we’ll see what we can do. Mike. Hi Matthew – do join up our Letter from Ireland at http://bit.ly/letterfromireland – thats the sort of question we try to answer. Mike. I’m so enjoying your journey on the Wild Atlantic Way. In June 2010 we did the first seven legs of your trip (in reverse order) on a bike tour. It was such a PERFECT way to see and experience this area. I remember feeling like we had cycled to the far end of the earth when we reached the end of Sheepshead. We also had weather like yours in these pictures. Amazing!! Thanks for bringing up the memories!! Thats a great way to see the country – on 2 wheels! I’m glad the weather was so good for you Paddi. Mike. Hi Linda – thats the sort of thing we talk about on the (free) Letter from Ireland at bit.ly/letterfromireland Mike. I have been to Kilkrohane many of times and have stayed a few weeks in different holiday homes. It is one of my favorite stops in Ireland. 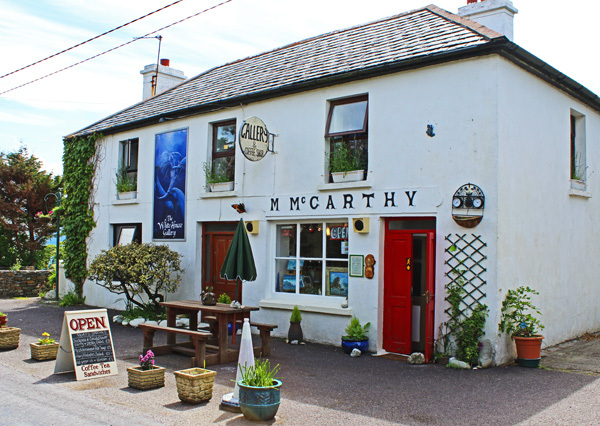 As stated before, the West Cork and Kerry areas are some of the best. Hard to beat the views from Baltimore up to Dingle. If possible a month of coastal villages and touring can’t be beat. Sounds like heaven to me too Lance! Thanks for sharing, Mike. You struck gold for me, My Great great great grandfather Michael Cotter came to Australia as a convict in the 1820-30’s (his brother Garrett, was sent out 10 years later) I have given up trying to obtain any information re the rest of my family back in Ireland, but your letters help me to feel as if I am also there. We have always had very strong opinions and a sense of righting wrongs and a great sense of family. Due to family members with very bad health I do not feel as if I will every get there but the connection is very similar to how the aborigines feel about Australia, you are one with your homeland. Thank you for these pictures and the letters. You are welcome Michelle – thanks for sharing those thoughts – Mike. hello, I’m on a constant search to locate great grandfather Jeremiah Keane of Glengariff Road, Bantry married to Kate Leahy. sorry should have said any living relative of my great grandparents. To help you get started ..
We have found that most people find the following step-by-step guide very useful for tracing their Irish ancestors. Step 1- we talk about how to trace back to your first Irish ancestor in your own country. Step 2 – we show how to use Irish online records to discover more. There is even a bonus suggested Step 3! Do go through this guide – it’s important to give it the time – and let us know how you get on. We find that some people like assistance in going through this – but do not want to hire a genealogist. We created The Green Room (see more here) for people who want this low-cost assistance. Hope this helps with your question – all the best, Mike and Carina. Wonderful journey providing great pictures of the area. 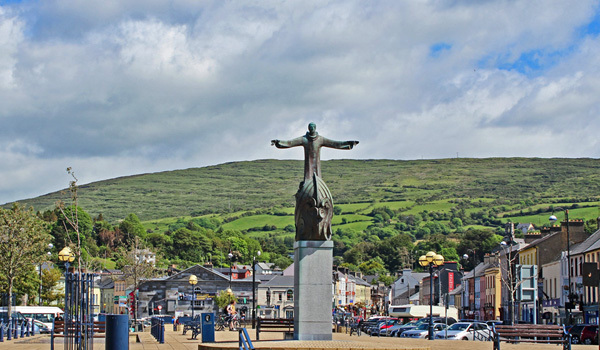 Looking forward to visiting Bantry in particular. It is a wild and beautiful part of the country Carolyn. You will love it.